Note: I’d say it’s a coincidence that this post appears on Julia Child’s 100th birthday, but I don’t believe in coincidences. When I need a specific recipe, I frequently forget to check the growing collection of cookbooks I have and instead turn immediately to the Internet. But when I needed a quick recipe for chocolate icing, the Internet had far too many options. To the bookshelf I went, and of course, Julia Child delivered. 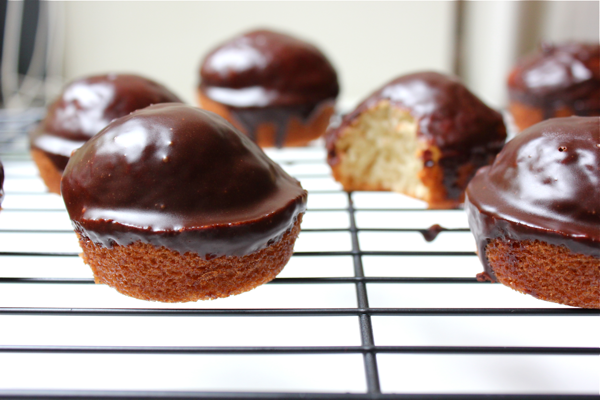 This chocolate icing was exactly what I was looking for: few ingredients, fast, easy, and I could dunk my cupcakes in it. I’ll share Julia Child’s measurements, which make enough icing to cover an eight-inch cake, but I decreased them for my nine cupcakes. To start, bring a small pot of water to a simmer. Set a large, glass bowl over the pot to create a double boiler. Add 2 ounces of semisweet baking chocolate and 2 tablespoons of either rum or coffee into the bowl (I used rum, delicious! 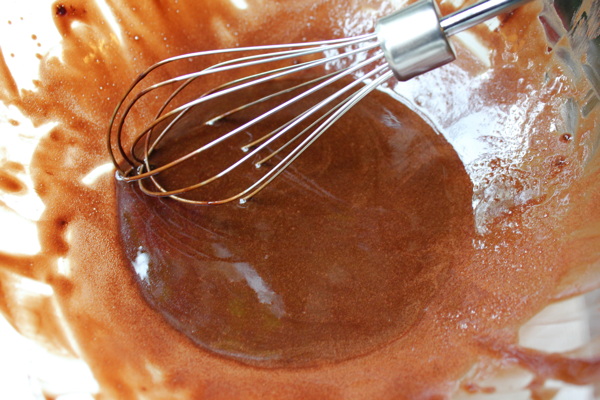 ), and let the chocolate melt until it is smooth. Then, beat in 5 tablespoons of butter, 1 tablespoon at a time. Once the butter is incorporated, remove your glass bowl from the heat. Set the bowl of chocolate over another bowl that is filled with ice water. Beat the icing until it thickens to a spreading consistency. Because I was dunking my cupcakes into the icing, I let the chocolate cool until it dripped off of my whisk in one, thick strand. Once the icing reaches the right consistency, spread it on your cake immediately or else it will harden too much. This recipe is from Julia Child’s Mastering the Art of French Cooking.